The Redwood RB160 Beginners Electric Bass Guitar is a fantastic model for those who’re new to the instrument. 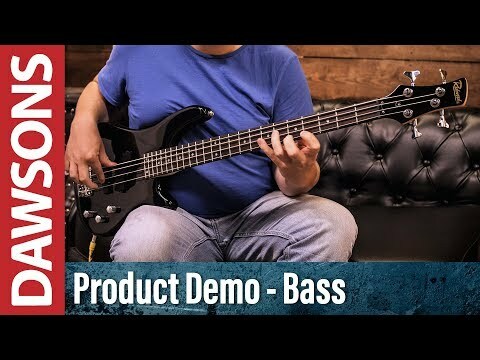 There is nothing better than developing your playing technique on a well-crafted instrument, and Redwood have ensured that this beauty feels every bit the high-quality bass at an astonishingly affordable price. Not only that but the RB160 has versatile tone shaping capabilities, allowing you to find your sound with ease. The most important part of any good bass is the body wood. With this in mind, the Redwood RB160 Beginners Electric Bass Guitar is constructed from alder. Alder is commonly used in bass guitars because of its great low end and midrange clout - with focus on the lower mid-range - to give your signal incredible bounce. Alder also benefits from having an impressive level of sustain, whilst remaining lightweight enough to make the bass a joy to wield. The neck provides the perfect support to run your fretting hand along. Paired with the neck is a blackwood fingerboard that is home to an impressive 24-frets, giving you a two-octave playground to lay down some serious fretwork. The Redwood RB160 electric bass guitar is fitted with a split single-coil pickup in the middle position, and a single-coil in the bridge position. The timbre of the alder is delivered clearly by the pickup pairing. Control comes in the form of a master tone pot, and individual volume controls for each pickup. By using the controls, a wide range of tone can be extracted to play with. Using the output of the split single-coil in the middle position independently, the fat, uncompressed tone of the body, neck and fingerboard combination is delivered with a robust and forceful attack. Soloing the output of the bridge pickup gives a much tighter response with heavy emphasis on the upper frequency range, and greater articulation in the attack of each note. By combining both pickups, a more complete sound image of the bass is fulfilled. The RB160 has been fitted with a fixed bridge to keep strings locked in position securely, reinforcing the stable playing feel. The tuning machines hold each string securely, ensuring that the tuning will only change when you choose to make an adjustment. If you’re looking for a beginner’s bass guitar that is quite forgiving in its response, then the Redwood RB160 beginner's electric bass guitar is a fantastic choice. With an impressive two-octave range across four strings, and a pickup arrangement that suits a wide range of musical styles, this bass allows you to develop and flex your creative muscles in style.